This year again Palestine was centre stage at the National Union of Teacher’s annual delegates conference in Harrogate during the Easter weekend. Dozens of NUT delegates flocked to the PSC stall to sign the petition asking for sanctions on Israel, as well as finding out about our current campaigns and to purchase some essential PSC merchandise. 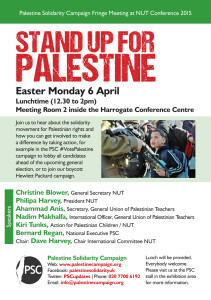 The President of NUT, Philippa Harvey also spoke of her recent visits to Palestine, and East London teacher Kiri Tunks, and representative of Action for Palestinian Children shared with the meeting the ongoing human rights breaches against Palestinian children at the hands of the Israeli army and settlers in the occupied territories. 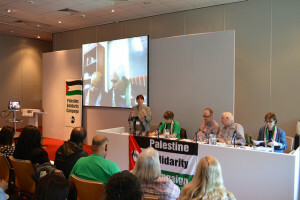 The meeting, expertly chaired by Dave Harvey, Chair of the NUT International Committee, drew to a close with a contribution by Nadim Makhalfa, International Officer of the GUPT (by Skype), reminding us that we need to continue to work and campaign against the illegal Israeli occupation of Palestine.